The vast majority of Jews refuse to acknowledge that a terrible wrong was done to the Palestinians by Zionism, the terrible wrong being, and only starting with, the creation in Arab Palestine of a state for some Jews mainly by terrorism and ethnic cleansing; a process which saw upwards of 700,000 Palestinians dispossessed of their land and their rights. In that light, how can the chief rabbi claim that on the Day of Atonement Jews “apologize for all the wrongs we’ve done”? Either he doesn’t know that a wrong was done to the Palestinians by Zionism, in which case he sees no need for Jews to apologise for it and seek forgiveness; or he knows that a wrong was done but cannot, dare not, say so. In the view of this goy (me), Days of Atonement which ignore the need for Jews to be honest with themselves about Zionism’s crimes in Palestine are nothing but Jewish theatre. I heard the Rabbis talk,. It was moving, wonderful but there is deception in all such Orthodox Jewish moralising. It is taught in the (Orthodox)Talmud that adherence to high moral principles is only to be practised between the Jews themselves. It is not libellous to say this. Their own texts assert it. The Talmud is a barely credible text inasmuch as the treatments recommended for the 'goyim' (that's us) are quite shocking. After 1945 the 'Kol Nidre' was reintroduced into the Tom Kippur prayer cycle. This shocking prayer releases those who speak it from any promise or contract they make with a non-Jew in the coming year. It is an annulment of future vows. Unfortunately, when the good Rabbi speaks his words as if they are to be universally applied, he is deceiving us.....misrepresenting his faith. Alan,they don't seem to think they have anything to apologize for; they believe G-d wants them to have Palestine by any means necessary. Absolutely right. Some American Jews tell me that they don't care anything at all about Israel and to leave them out of it. I am very offended by this attitude because the crimes that have been committed by the Zionists were perpetrated in their names, on behalf of them. Just ask any Zionist who Israel represents. So, you cannot just turn away and say it is none of my business because your name has been used to justify theft, murder and banishment. All Jews everywhere must recognize the wrong and take steps to repair the damage. Without this, Yom Kippur is a lot of sanctimonious crap and Lord Sacks a disingenuous hypocrite! "His Lordship's top of the moral high ground" - remind me his fellow Jewish Brits Gilad Atzmon, who said: "Everytime a Jew talks about Jewish morals, I take a cover. I suggest you should too". Several American Jewish organizations along with the Iranian ‘royalists’ Americans (Iran 80) are planning to stage protests outside the UN headquarters in New York City on September 26, 2012 against Iranian President Dr. Ahmadinejad being allowed to address the UN General Assembly on Jewish Holy Day of Yom Kippur (Day of Atonment). One doubts Ahmadinejad chose the date that was allocated to him by the Zionist occupied United Nations. Before the sunset on the eve of the Day of Atonement, Jews recite the Kol Nidre prayer, which reads: “All vows, obligations, oaths and anathemas, which we may vow, or swear, or pledge, or whereby we may be bound, from this Day of Atonement until the next, we do repent. May they be deemed absolved, forgiven, annulled, and void, and made of no effect; they shall not bind us nor have power on us. This vow shall not be reckoned vows; the obligations shall not be obligatory; nor the oaths be oaths“. I'm not sure it is correct to conflate Jews with Israeli in the sins against the Palestinians. It is more the Zionists that are at fault rather than Jews in general. So, if I were a Jew I wouldn't it feel incumbent on me to atone for such sins. Nevertheless, Lord Sacks might take umbrage after reading Rabbi Michael Lerner's recommendations about what might be atoned for. It's sort of like saying all Muslims should feel responsible for 9/11. That is, if you believe Muslims were behind it in the first place, which I don't. No point in worrying about an apology or show of remorse from international Jewry. Why? Because Judaism is dead. It simply does not exist any longer. There are more people today practicing Animism than Judaism. "In the view of this goy (me), Days of Atonement which ignore the need for Jews to be honest with themselves about Zionism’s crimes in Palestine are nothing but Jewish theatre." It should read, "Days of Atonement are nothing but zionist theatre." The fallacy (theatre) is, that Judaism still exists. "..Because Judaism is dead. It simply does not exist any longer...."
The majority of Jewish people may be 'secular' or non-religious, but we see the Lubavitchers in every country, the belocked Hassidic Jews around us, the central (even dominant) role of the Orthodox Rabbis in Israel and know this is not true. Have you heard the statements made by Netanyahu's friend Rabbi Yosef over the past couple of years? What are you trying to pull by making a ridiculous statement like that? Are you saying there is no such thing as 'international Jewry'? @maryam You make a good point: What's the difference between Jewish responsibility for IP and Muslim responsibility for 9/11? There are crazies everywhere and unacceptable acts are unacceptable to most people regardless of their doctrines, religions, ideologies. In the case of Palestine, however, we are talking about long term, long range policies not individual terrorist acts. Zionism is a set of policies that are, in my view, repugnant. World Jewry has supported or remained silent with respect to these policies and therefore I hold world Jewry responsible, each and every one of us. It is the same guilt that is often expressed about Germans who stood by and watched as neighbors disappeared or did nothing when they saw trainloads of clothing arriving in Berlin. They knew and they remained silent and that is their guilt. Likewise, here with Zionism: Jews everywhere know what Zionism has done and they either by the fantasy story or they have brains enough to look for answers -- no matter, we are all liable here. What is celebrated in synagogues around the world? What beliefs are active on Sabat worlwide? Do you mean that Judaism is dead as a moral force? Or is it replaced with Zionism? What? If you mean the first, I would agree. When I argue that Jews worldwide are liable for Zionist crimes, I do not do so as an extension of Jewish "morality" because the argument of knowing and remaining silent is not compelling under Jewish law and neither is the extension of guilt to a population. Rather, I do so as a liberal thinking person, an "intellectual" if you can tolerate the term. As for Judaism, I do think it is dead in the water. Whatever universality might have been in the faith has been done in by Zionism and its exceptionalism and regionalism ("facts on the ground" as everyone is fond of saying). Regionalism as nationalism has reduced G*d to a local tribal deity who is on the prowl for human enemies of his elected tribe. The deity that emanates from Jewish Israel is primitive and homicidal and the Jewish conversation with Him has reached a dead end with Israel or rather been reduced back to its origins in tribal feud and mayhem. I have no interest in Israel because of what it has meant to Judaism. And Judaism is now bereft of relevance and meaning. No, no sympathy for Lord Sacks. The Zionists have arranged a resolution in CA urging universities and colleges in California to crack down on anti-Israel demonstrations etc. as "anti-semitic." It is such a unique inversion of the truth that, had I any left, I would tear my hair out in exasperation. Anti-Israel is anti-racist because Israel is racist. The Zionists want their racism in Israel (where it belongs) but do not want to be identified as a "race" or ethnicity here! If you do so, you are anti-semitic. So, anti-semitism is anti-anti-racism or simply racism. Why would the legislature close down anti-racist demonstrations on behalf of a racist group and how compatible is this with First Amendment rights? The legislators are simply paid off schmucks. "Do you mean that Judaism is dead as a moral force? Or is it replaced with Zionism?" I mean both and more than that. There are over one billion Christians and over one billion Muslims. How many Jews are there? How many of those who call themselves Jews believe in a higher power? How many of these will be practicing their religion in another 50 years? How many? The answer is; an insignificant number. I too have called on world Jewry to stand up and represent their moral values. The result was silence. No clattering of chairs, no drubbing of feet, no call to re-install Jewish values; no call back to the faith. I believe now; what we call Judaism, no longer exists. It is in actuality a dead religion. There may still be some practitioners scattered and isolated but I believe no unified group. Importantly, statistics show that there are no new conversions. "As for Judaism, I do think it is dead in the water." "And Judaism is now bereft of relevance and meaning." "Israel, you make us proud ... Israel: you are our people and our pride and we stand with you today." I am having some strong emotion after reading this. I think it is contempt that I feel. @Davey Wavey, there is a huge Christian Zionism movement in the US and those people have tremendous political influence. So whether or not Judaism is dead is irrelevant, as far as a religious-based movement to support Israel goes. I still disagree but I do see your point, especially in light of the fact that there is enormous social pressure among Jews to support Israel, or at least there used to be. I think the internet has helped to lessen this pressure due to the access we all have to alternative points of view, and time itself is putting distance between the holocaust more than 60 years ago and the need Jews felt for Israel as a guarantee that the Jews would survive. Jews don't need to support Israel; unfortunately, there are others who are taking up the slack. @Davey Wavey - Historically, the followers of the 'Law of Moses' were called themselves 'Israelites' or 'Hebrew speaking people' - and not Jews. As professor Shlamo Sand claims, the term Jews and Judaism are new inventions and have nothing to do with Moses, David, Solomom or the Ten Commandments. Zionism, though supported by the vast majority of 12.7 million world Jewry - is not replaced Judaism as a religion. However, a few years ago, Israeli professor Yeshyahu Leibowictz did claimed that Holocaust has become new Jewish religion. @David King - There are 1.1 billion Catholics + 0.6 billion Christians belonging to other denominations. World Muslim population according to Muslim and CIA Fact Book is close to 2.0 billion. Jews make 12.7 million world population. You also cannot consider Judaism purely as a religion. "More people practice animism" means nothing, really, because the Jews don't seem to know just what the hell they are. They're not a religion anymore because most of them seem to be atheists; they're not an ethnic group because only a few are Semitics. Gilad Atzmon addressed it nicely in his book, "The Wandering Who," a courageous book that has been condemned by some as anti-Semitic (not surprisingly, since it is one of zionism's preferred defenses against the truth). Never mind that Atzmon is himself an Israeli Jew. I agree entirely on "@ William Smart" comment. Israel tore up Lebanon, killed thousands of innocents and destroyed much of the country with its entirely modern army. It was opposed by Hezbollah "fighters" not mechanized armor. It is unimaginable that anyone would sympathize with these vulgar bullies...e.g. Sharon. In my deepest fantasy, a real army smashes up the IDF badly and Israel is forced to sue for peace on the opposition's terms. Anyone share this fantasy? I do. I think it would happen with Iran, if the US chose not to support an Israeli attack. Israel got trounced by Hizbullah in 2006, and they have not fought a regular military opponent and prevailed in the many years since they fought Egypt. Stomping mostly unarmed Gazans with two-ton bombs and white phosphorus is one thing, but dealing with an opponent who can fight back is quite another. There is also the belief that if enough Jews condemn zionism, it will turn things around and zionism will die out and fade from history. The problem at this point in time is that there is a different engine running the zionist machine now, and it's not really Judaism, but zionist banking and corporate cartels. Money is flowing from these cartels (a one-man cartel is none other than our friend Sheldon Adelson) into the pockets of the US Congress, who vote to send US taxpayer money to the pockets of the Israeli government who, among other things, work the crowd, via the news media, in entertainment and on the internet, to promote zionism's interests and spread the "Israel as victim" myth, the tiny country of good guys surrounded by Arab Muslim bad guys. This is an oversimplification, but it's the general idea. I do think that if enough Jews condemned Israel and stopped the Lobby, Zionism would slowly erode (like communism), Israel would be a densely populated multicultural state and the word "Zionism" would be defunct, like "communism." @David King - re: "I am having some strong emotion after reading this. I think it is contempt that I feel". One cannot be selective who you think "deserves" compassion: That should be the basis of true Attonement, not some crocodile tear shedding acting. One has to cynically look at Theocrat posturing as just another Corporate PR Exercise, which I feel it is. 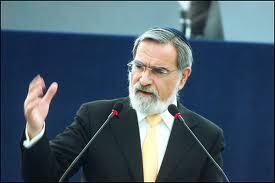 "Jonathan Sacks's feet were being held to the fire in 2006." So "Britain’s Chief Rabbi," was willing to compromise his religious beliefs and his principles, to keep zion off his back? We can see now, that Judaism isn't strong enough to stand against zion. Once again, Judaism is finished as a belief system. They are on a downward spiral from which they will not return. "Have you heard the statements made by Netanyahu's friend Rabbi Yosef over the past couple of years?" No I had not. I was happily ignorant until I read your link. Having read that article, I am at a loss to understand the reason you posted it: unless of course it was to lighten your tone. One would expect that his curse would be as effective as his "blessing". "What are you trying to pull by making a ridiculous statement like that?" What am I trying to pull? Well I don't think that I can answer that. I was expressing my opinion. Is that no longer possible? "Are you saying there is no such thing as 'international Jewry'?" Yes I am. As a movement; as a force, as an authority to speak on behalf of the Jewish religion. I do not acknowledge that you can be secular and Jewish. If you do, that is your business. Total Jewish population 12 million globally. That leaves 7 million international Jewry. 40% are religious. Now we are down to 3 million. The largest group are in America and number 2 million. The third million are scattered. Look at William Smart's post. Britain's top Rabbi backs down as soon as zion raises it's voice. You heard it here first; Judaism is dead. No wonder the Israelis are sweating bullets over the rapidly changing demographics of Palestine and are offering very attractive aliyah packages to Jews. But it's also sad to see the racism at work, too - their rejection of Jews from sub-saharan Africa, for example. There is also a strong propaganda campaign inside Israel aimed at young Jewish girls, discouraging them from marrying Arab men. I believe that Jews are racists and, if this is so, then libeling someone "anti-semitic" does not necessarily identify a "racist." To be opposed to Jews may be interpreted as opposition to Jewish racism, a position that can be liberating and democratizing, both now anathema for Jews. So when Jewish organizations conspire to halt free speech on campuses, for example, they are asking that free speech be abridged in the interests of racism. The California said it was opposed to anti-semitism, not opposed to racism. Of course, it should have passed a resolution denouncing racism in keeping with the Constitution and American values but instead they pass the exact opposite resolution! I consider this evidence of the grip of Zionists on legislators in this country. So, I no longer shudder when I hear the libel "anti-semitism".They may something right in that sentiment. It can be a revolutionary doctrine depending on what is meant. Some have called "anti-semitism", a poor man's marxism, for example. I am not advocating elimination of all Jews because that would include me and my family, if for no other reason. I am suggesting that we start accepting the libel without such quibbling and stand firm in opposition to Jewish racism, at least. "No wonder the Israelis are sweating bullets over the rapidly changing demographics of Palestine "
I have some information on the US. Within the United State; those Jews belonging to secular, reform and conservative categories have inter-marriage rates of below 50% and birthrates of under 2. These groups represent 1.5 million of the 2 millions Jews in he US. There are 600 000 Orthodox Jews. The grandchildren of these people will not be Jewish.
" their rejection of Jews from sub-saharan Africa,." I guess Jew isn't a race after all. I guess things are tough all over. On the other hand, Islam is the fastest growing religion in the world. It's much, much easier to convert to Islam than to convert to Judaism, but something else could also be happening. Perhaps the increasingly negative view of the world toward zionism could be discouraging people from embracing Judaism. It's just a thought. @Maryam Not sure what you mean about conversions. Zionism is (1) utterly reprehensible and offensive to any progressive and (2) nearly inseparable (unfortunately) from Judaism and surely these realizations must affect conversions. Only religious crazies and uninformed sentimentalists are going to want to identify with Israel and so conversions should be very slow. Incidentally, a Jew from anywhere is automatically a citizen of Israel upon election. Is a converted Jew also covered by this law? Lastly, and just for fun, I want people to think about the following oxymoron: "American Zionist," "dual loyalty" and "liberal Zionist." People tolerate this doubletalk: Americans have been "had", "snookered", abused and cheated by these Zionists. Not sure what I mean? Was I writing in Chinese? I was talking about converting to Judaism. The religion. Becoming a Jew by choice. I was not saying anything about zionism. Yes, Jewish converts can make aliyah. All they need is a document from their rabbi attesting to their conversion. Don't you understand that many Israelis are either converts or the descendants of converts? My best friend is a Jewish convert, and is also one of the most dedicated anti-zionist activists I know. @maryam Ha Ha! No need to get snooty! I wasn't sure if you meant to suggest that conversion would not be "fashionable" today or that it slows by virtue of the heavy moral issues raised by Zionism. If a convert can make aliyah, then why don't at least some Palestinians (a good number) convert officially and claim citizenship? Conversion would then bring with it the right of return. The weight of conversion among the Jewish people as an ethnicity over the centuries is controversial at this point. Some scholars claim the ethnicity is skewed by many more AND MUCH EARLIER conversions than other scholars. How does Israel decide if one is Jewish? They look at the antecedents which is the primary route to citizenship among immigrants I am sure. Conversion has to be a distant second, if that. @Davey Wavey: Hah! That has been my solution to the problem for years. Mass conversion and assume ownership. They could call themselves conversos, but of course the Zionists would call them Marranos. The problem is, what Rabbi would convert them unless they could find one who is a converso him/herself? Because it is a stupid idea. That's why. No - it's not stupid. The policy of the Jewish "return" is stupid and that is what this program could show. And the ethnic cleansing continues to this very day. Repeat a lie often enough and people will believe it: no wrong is being inflicted upon Palestinians. Davey Wavey, I am very disappointed and saddened by all the terrible things you've said about Zionism, Jewish people, the Jewish religion, etc. I was enjoying your videos on YouTube and will no longer watch them because you are such an ignorant obnoxious fool. Too bad you couldn't stick to gay issues which may be something you know about. Obviously, you know nothing about Judaism and Zionism. I love them both. I am Jewish but not a practicing Jew but I visited Israel for the first time last year and had a wonderful and inspiring trip. The Palestinian leadership is the most corrupt and evil group on the planet and they have wronged their people. The Jewish State has not wronged the Palestinians. I'm sure there are some nice Palestinian people who would truly like peace but most hate the Jews and Israel just as you do. It is sad to me that someone who is as entertaining as you had to vocalize such horrible thoughts and incorrect theories just because you know about body building and think you know about gay issues. You are a terrible ignoramus and it saddens me to have to say this. First, everyone has a good time in Israel. So what? People have a good time at Disneyland, too. SEcond, the "Jewish State" is corrupted through and through. The sign is the corruption of language "present absentee" "unrecognized village" "disputed territories" "democracy" These are all ridiculous circumlocutions regularly in play in Israel. "The Jewish State has not wronged the Palestinians." If this were true, then land theft, property theft, torture and murder are not "wrongs." The Jewish State and the Jewish people, including you and me presumably, have grievously wronged an innocent people for the purpose of taking their patrimony from them. If ever a people had the RIGHT to hate another, if ever ever, the Palestinians have the right to hate Jews. And yet they do not. They want justice, not revenge. If Jews can extort money from European governments ala holocaust, then Pals have claim to huge reparations for their suffering. Jewish money should be paying this, not building settlements housing ugly supremacists and racists. I would say you are little slow on the upbeat here. I would say this, but I suspect you are not a person, as such, but some hack hired to push back as best you can. BTW -- the Israel you enjoyed and inspired you (false feelings) was built on stolen property. It is not biblical Israel, but a racist piece of dung, an embarrassment to Judaism. I predict it, not guys like me, will destroy Judaism because Zionism is incompatible with Judaism, or least a universalist interpretation of Judaism, the only kind that should survive.